I’m a bit proud of myself for making these. Sure, making potato cakes isn’t that hard to do, so why am I making a big deal about it? Let’s just say my time has been otherwise occupied recently. 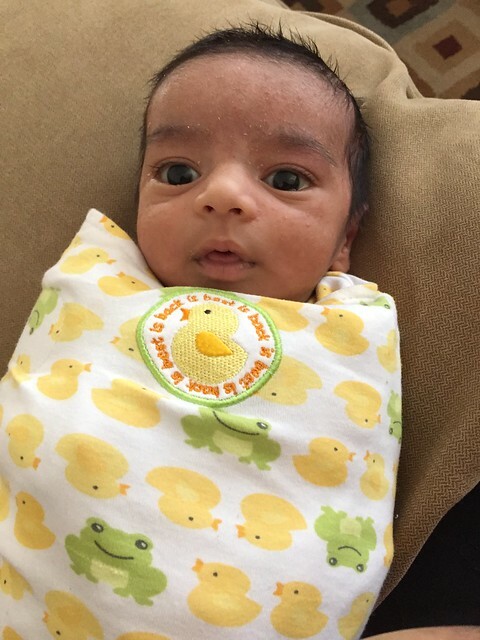 Meet Baby N! He made his debut in August. I think he’s a pretty good reason! Somehow he managed to nap long enough for me to make these and take photos of them. I think that was a fluke though! When my fellow Stonyfield Clean Plate Club members and I were offered the chance to come up with recipes combining either red lentils or orca beans from Bob’s Red Mill with Stonyfield Organic Greek yogurt, I was really craving comfort food. 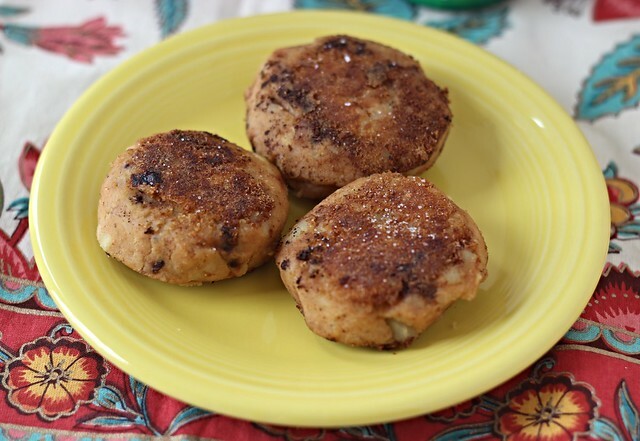 I based these off my Spiced Black Bean and Potato Cakes, which are a twist on Bengali aloo chops – spicy fried potato croquettes with a meat filling. The red lentils are cooked in a small amount of water so that they cook down into a thick paste, which serves as the binding for these potato cakes. The cakes can be dipped into egg and coated in bread crumbs before pan-frying, but I think they are fine without doing so. I’ve approximated the measurements for the spices below, I was playing around with the spices and think these are best adjusted to one’s taste. Bring lentils, ginger and garlic pastes, and water to a boil in a saucepan. Once water comes to a boil, keep an eye on the pan and stir frequently as lentils cook for about 10 minutes. Lentils will soften and mixture should begin to thicken. Lower heat as needed and continue to stir until lentil mixture begins to dry out and form a thick paste. You’ll get approximately 1 cup of this mixture. Combine with the mashed potatoes and set aside. In a separate saucepan, heat up 1 tbsp. oil over medium-high heat and then add chopped onion, cooking and stirring for 5-10 minutes, until translucent. Take the spices and add some water until it forms a thick paste. Add spice paste to onions and stir to combine. Now add the lentil-potato mixture and coat with onion and spice mixture. Taste and adjust seasonings as needed. Take pan off heat and let mixture cool completely. I placed the mixture into a bowl and refrigerated overnight, but you don’t have to do this. Once spiced lentil-potato mixture has cooled, use your hands to create little cakes – I got about 6 cakes. If you want, dip in beaten egg and breadcrumbs, but I skipped this. Pan-fry the cakes in oil until golden brown on both sides. To prepare the harissa yogurt sauce, add harissa to Greek yogurt to your desired level of heat. Add salt as needed to taste. 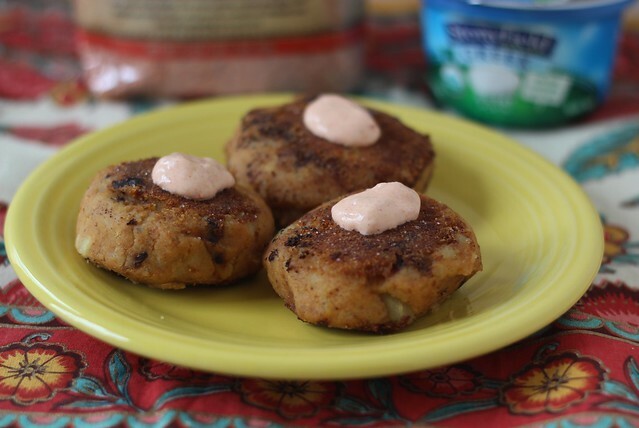 Serve red lentil and potato cakes with the harissa yogurt sauce dolloped on top or as a dipping sauce. FOOD GOOD BUT PRECIOUS BABY!!! Cutie pie baby!! potato cake looks yummy too.